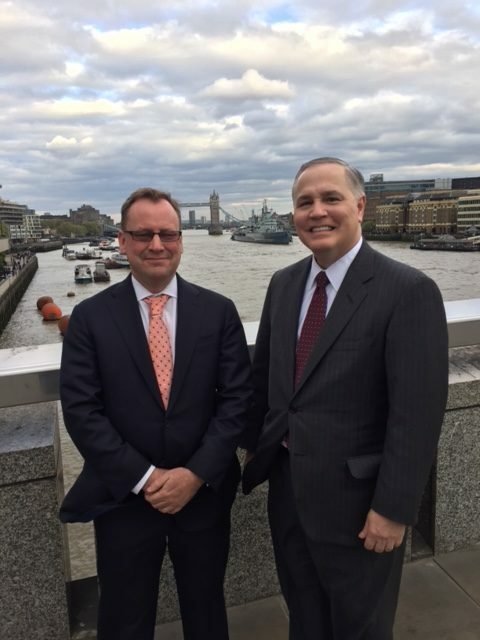 An ATPC-led delegation including Executive Director H. West Richards and Secretary Robert Green, traveled across the pond in early April to continue securing commitments for the inaugural P20 Conference in October. As part of the trip, the team – including P20 Chairman, Peter Radcliffe – attended both the two-day Innovate Finance Global Summit 2017 conference and the one day U.K. International FinTech Conference. Among other dignitaries the Innovate Finance Conference included Alastair Lukies, UK Fintech Global Ambassador & Event Chair; Lawrence Wintermeyer, CEO; and David Beer, organizer of the Summit. The U.K. International Fintech event included many of the U.K.’s leaders in business and finance, like: Simon Kirby, City Minister; Liam Fox, UK Secretary of State for International Trade; Eileen Burbidge, UK Treasury’s Special Envoy to FinTech; Mark Carney, Governor of the Bank of England; Alastair Lukies, UK FinTech Global Ambassador; and Philip Hammond, Chancellor of the Exchequer. All of these individuals have been cornerstone members, and/or will play a vital role in the upcoming London P20 Conference. Finally, the team had an opportunity to network at the Chancellor’s Dinner following the conference’s first day, hosted at the Mansion House – residence of the Lord Mayor, and visit Level 39 – a FinTech incubator in London’s Canary Wharf. Stay tuned to the ATPC website and look for upcoming digital communications regarding the P20 Conference.